Roller banners work really hard for the businesses and earn back the initial price invested by generating interest on the exhibition stand and thus gaining buyers from the special offers at the event or sale. They can be used in the business premises to introduce the visitors to the products and services of the company. They are very useful in making presentations or undertake staff training. The roller banners add extra dimension to the business as they allow giving extra advertising space. They are used to make a special offer display for any show or event. In an outlet, they can be used as a sales banner, for businesses, they can be used at reception, boardroom, to give a warm welcome notice to the visitors and as an introduction to your products and services. While giving presentations or promotional talks, a suitable graphic panel on the stand may give more impact than the words. 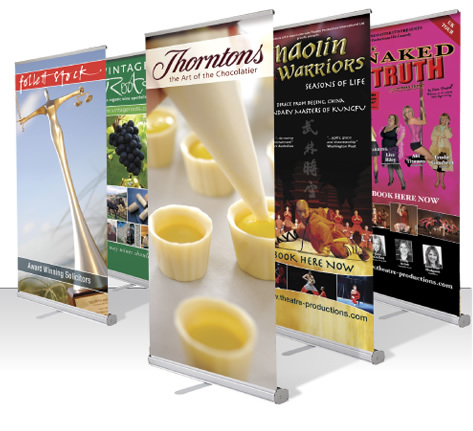 Largeformat-print provides several sort of roller banners from which you can choose one as per your needs. You can earn a lot of money through roller banners, as you can use them over and over again and they look very stunning with the graphics designed on them. We also provide them with an image on the back as well, which provides you with the second selling opportunity to catch the attention of the people while walking in opposite direction. They act as invaluable promotional tool through which you can repay your tiny investments, many times over.